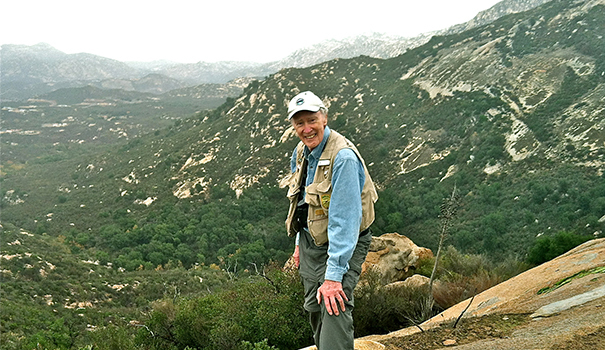 San Carlos resident Phil Pryde has many achievements to be proud about — helping establish the first federal wilderness area in San Diego County, co-authoring an environmental textbook, acquiring land for Silverwood Wildlife Sanctuary, stopping the build of an environmentally hazardous flood channel, and now the first-ever National Cox Conserves Hero award winner. The award comes with a $50,000 donation to San Diego River Parks Foundation (SDRPF) in Pryde’s name. “He’s incredible — so dedicated to preserving the environment and inspiring the next generation of environmentalists,” enthused Ceanne Guerra, spokesperson for Cox Communications. Cox Conserves Heroes has been a regional competition of Cox Enterprises, parent company of Cox Communications, and the Trust for Public Land since 2008 (2009 in San Diego). The public nominates “unsung heroes” who are helping to conserve, preserve and enhance outdoor public spaces. Those heroes are reviewed by a panel of environmental experts and executives; this year, the San Diego panel included a reporter who covers environmental issues in Orange County, a former Cox Conserves Heroes winner; a representative from I Love a Clean San Diego; and a representative from Bank of America, a supporter of the program. Winners receive a $10,000 check to go to the nonprofit of their choice. The level of participation has grown so much in the last decade that Cox Enterprises decided to make it a national contest. Each regional winner had a video made of them, and the national public’s vote determined the winner. Pryde has been fighting for and educating about the environment since the late 1960s, and was elated to hear that he won — but he is quick to note he is not a lone wolf. “I thought ‘gee whiz’ [when I first learned of the award]; nobody does anything by themselves. I have to give thanks to all the people who have helped me,” Pryde said. Pryde first discovered the power of the people when he moved to San Diego from Seattle, Washington. He had attended graduate school in Seattle and accepted a teaching position at San Diego State University — a place where Pryde felt he could work for a lifetime. That prediction came true. 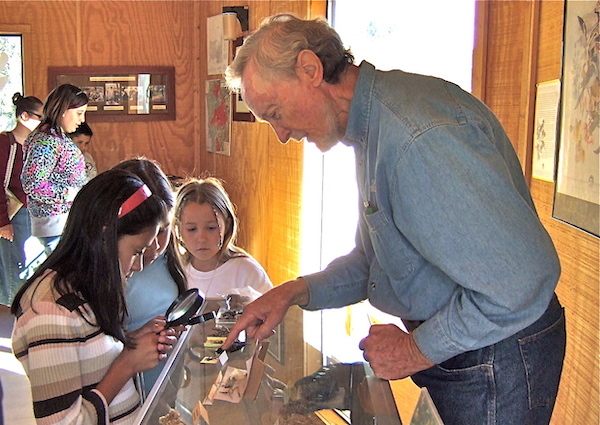 Pryde was a professor at SDSU for 32 years in the Department of Geography, where he edited and partially authored all five editions of the textbook “San Diego: An Introduction to the Region.” Pryde still serves as professor emeritus and third reader for masters theses. His initial drive from Washington to San Diego in 1971 took him through Los Angeles, where Pryde made a pitstop by the Los Angeles River. In 1938, a section of that river had been turned into a flood control channel by the U.S. Army Corps of Engineers. By the 1970s, according to Pryde, the channel had lost its natural beauty and was overrun by pollution and trash. When he arrived in San Diego, Pryde noticed that river was still natural, but heard of a plan by the Army Corps to do the same thing as in Los Angeles. “I said, ‘not on my watch,’” Pryde recalled. He became the point person for opposition to the building of the channel. The Sierra Club San Diego, San Diego Audubon Society, and Citizens Coordinate for Century 3 (C3 San Diego) all came on board to assist in the fight. More than 1,000 people showed up at the public hearing, and Pryde himself wrote a well-researched letter to the Corps pointing out the flaws in their plan and logic. The Army Corps decided to forego the flood channel, made a list of nine alternatives, none of which were feasible, and in 1988 completed the First San Diego River Improvement Project (FSDRIP). FSDRIP covers a 7,000-foot section of the river from Qualcomm Way west to Highway 163, including flood control improvements, revegetated channel banks, and buffer zones. Pryde has since had several interactions with government entities, and has discovered patience is the key. Pryde’s patience won out again when working on behalf of the Silverwood Wildlife Sanctuary, owned by the San Diego Audubon Society. He was on the committee in charge of land purchasing, and learned about a federal law concerning unused public property: If a property borders a private organization that benefits the public in a certain way, that land can be turned over to the organization, Pryde said. That idea turned into a 7-year process, as no one had actually attempted the land turnover before. But now, the sanctuary has grown to 785 acres, still private, and still pristine. Pryde is still in the thick of government mire. His current project is working with SDRPF in creating the Discovery Center at Grant Park. It will be an 11-acre open space park and visitors’ center right across from iFly and SpringHill Suites. After four years, approval has finally been given through the city, and construction for utility lines is about to begin. The funding is there for the lines, and campaigns are in the works for the other phases. The prize money from Cox is slated to go towards this new center. And after that, who knows what will be next for, as Pryde puts it, “America’s Finest County”?